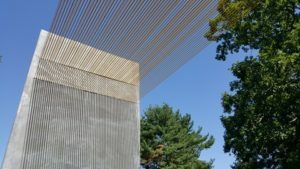 While the deCordova Museum and Sculpture Park has been around for decades, my personal history with it started when I was in college in the early 1990’s. 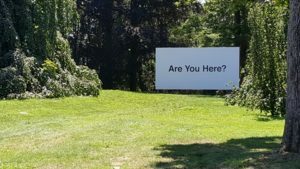 One day, headed back to Boston, I was intrigued by the sign for the deCordova Museum. A sense of adventure got the best of me as I peeled off the congested highway and onto the curvy country roads of Lincoln, Massachusetts. 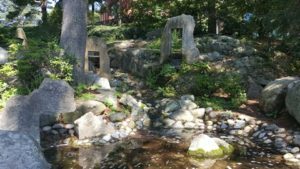 What a treasure to find the deCordova! 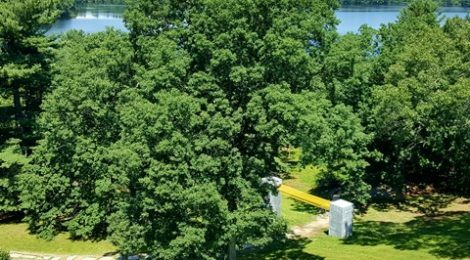 A hidden jewel of a museum, with bright green hillsides spotted with unusual and delightful sculptures. It quickly became one of my favorite escapes from the bustle of Boston. Now, many years later, I am back at the deCordova on a glorious summer day, it was, above all, lovely to be in the quiet comfort of nature, art and memories. 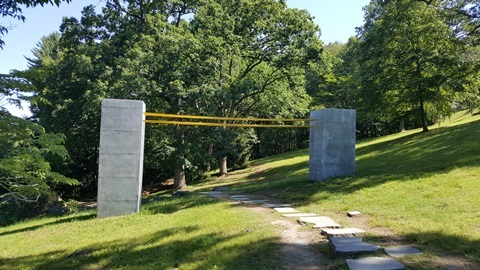 Rain Gates, an outdoor installation by Ron Rudnicki, greets the guests at the base of the hill. On this day, I decided to experience the art as it unfolded, though the option to listen to the mobile phone narration was available. Weaving and wandering through the maze of art and nature, I was in a meditative mindset when I looked up and stopped. There was something about this piece, titled Beacon by artist Stephanie Cardon. Standing like a sentry to the forest, but guiding me forward. Unhurriedly, I paused under the bright yellow cables that created a canopy of color and defused light. Much like a sundial, the shadow from the cables gave a sense of the passing moments as they gently stretched down the concrete column. I was reminded that the moments were fragile and fleeting. With a breath, I paused and smiled. More sweet thoughts to add to my deCordova mind bank. The rest of the day was spent both inside and out. The deCordova is a manageable size, though it seems like I always fill up quickly with musings and wonder. Knowing I had a two hour drive ahead of me, I rallied my sated soul to the car. As I drove away from the museum, this final installation called out. It was a billboard by Jonathan Gitelson. “Are you here?” it asked. Yes, I am. But the peace and restoration, generously supplied by those who made this place possible, I am taking with me. Great article Kimberly! I really enjoyed reading it.